KANSAS CITY, Mo. 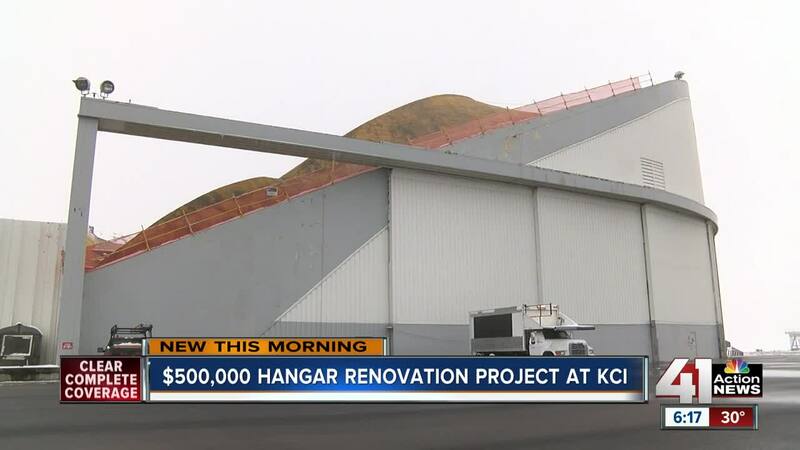 — Even with plans to build a new terminal in the works, crews are fixing the oldest hangar at Kansas City International Airport. The "Super Hangar" is separate from the passenger terminals. It sits east of the main facility and currently houses Aviation Technical Services, a company that overhauls and maintains passenger jets. Jade Liska, KCI’s deputy director of planning and engineering, said the now-defunct Trans World Airlines built the hangar in the 1950s. It’s made of two parabolic domes. In 2010, the city’s aviation department took over ownership of the hangar. Years without routine maintenance have caused the roof to leak. The aviation department has committed $4,001,722 to evaluate the structures, develop a repair plan, and make the necessary fixes. Liska said the project is worth the expenditure because the airport makes money leasing the facility and having a hangar of that size draws tenants who can repair planes flying in and out of KCI. Aviation Technical Services employs hundreds of people in the Kansas City region. “Having this in the skyline of Kansas City International Airport and knowing this asset is here is world-renowned for Kansas City and keeping it here and keeping it vital is an important part of that,” Liska said. The hangar has historical significance as well. As far as KCI leaders know, it was the first hangar built in the United States using cables to support the roof instead of columns. The domes are made of a concrete shell covered by a foam. Engineers said most of the original architectural plans are gone. They’re working backward to get a better understanding on how TWA first built the hangar. “It’s kind of like being a detective. That's what's really rewarding. To find the cause and present solutions to the clients so they can use the facility at its best level,” said David Ford, a managing director with Walter P Moore Engineering , which the airport hired to lead the project. As crews replace the old roof, one challenge is making sure no debris flies onto the airfield, including trees. The new roof will be made from a PVC material.